I love to make a light meal out of a cool and refreshing roasted beet salad, and this one comes complete with a sweet and citrusy vinaigrette, toasted hazelnuts and creamy goat cheese! A couple of months back, my husband Michael and I took a little outing to one of our favorite places to visit here in Los Angeles, The Original Farmer’s Market on 3rd Street and Fairfax Ave. This Farmer’s Market is a permanent open-air market with lots of produce, shops, and all sorts of good food. Tummies growling, we decided to go have a light afternoon meal at one of the quaint outdoor dining venues, a cute little French bistro we’d been wanting to try out. We ordered a couple of different items to sample and share, and to take delight in ooh-ing and ah-ing over together, among them a delicious roasted beet salad. This cool, sweet and colorful roasted beet salad was made with red beets, drizzled with a balsamic-style vinaigrette, sprinkled with herbs and micro greens, and complimented with a bit of good goat cheese on the side. And with a little twist of freshly cracked black pepper? It was out of this world refreshing, flavorful, and a bit of a healthy-yet-slightly-indulgent treat! And because I’ve always been a bit of a sucker for roasted beets—especially chilled ones with a good tangy dressing, some herbs, and that side of tangy-creamy cheese—I thought I’d take the inspiration I found in the version that the French bistro offered and prepare my own take! 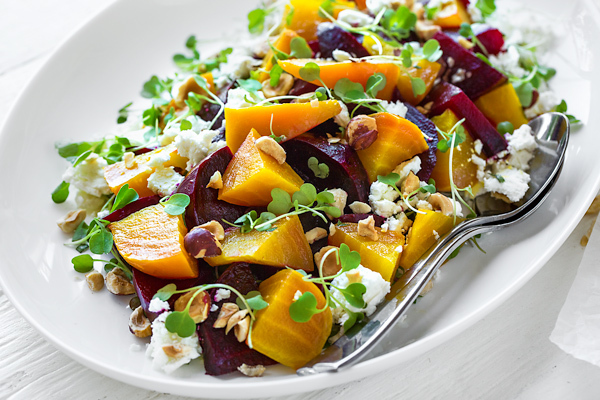 I love both the red and the golden beets, as each bring their own level of sweetness and wonderful, jewel-like vibrant color to a fantastic roasted beet salad recipe. And so for my version, I opted to use both. And because I love the flavor pairing of citrus and tarragon, and felt that it would bring out that wonderful natural sweetness of the roasted beets, I whisked together a simple vinaigrette with fresh orange juice, a touch of dijon, some olive oil, some sea salt, black pepper, and a pinch of tarragon. I even sprinkled some tarragon over top of the prepared salad for a bit of extra flavor! I kept the creamy goat cheese as a part of my own recipe, while giving it a bit of extra crunch with toasted hazelnuts. The result was cool, clean, sweet, colorful and flavorful—everything you’d crave and hope for in a tasty and refreshing roasted beet salad recipe. It’s a wonderful option as a light meal, or to serve as a bit of an elegant starter course for a special menu! I’ve prepared roasted beets in the past by first peeling them while raw, quartering them, tossing with olive oil, salt and pepper, then roasting on a sheet tray. I begin by preheating my oven to 400°; I prepare my baking sheet with foil or parchment paper. I scrub my whole beets to clean them, and then I cut the leafy tops and the “root-y” bottoms off. I do not peel them at this point. Next, I place them into a large bowl, drizzle a touch of olive oil over them (to help keep them moist), and wrap each beet individually in a piece of foil. I place the foil-wrapped beats onto the baking sheet and I roast them for 1 hour, or until I can easily pierce through the center with a paring knife. Still wrapped in their foil, I allow the beets to cool for a little bit (about 45 minutes), just until I can handle them; I partially unwrap each one, and place them onto a cutting board to hold. Then, I prepare three bowls and get some pieces of paper towel. Beginning with the golden beets, I rub the paper towel over them to scrub the skin off (the skin should come off quite easily), discarding the messy skin into one of the bowls to avoid staining. I place my peeled beets into the other bowls to hold, one for the golden and one for the red. Using parchment paper, I line a cutting board (to avoid staining) and slice each beet into quarters, placing them back into the bowls—my red beets into one, and my golden beets into another to keep their colors separate. I then proceed with the remaining steps in my recipe for roasted beet salad! 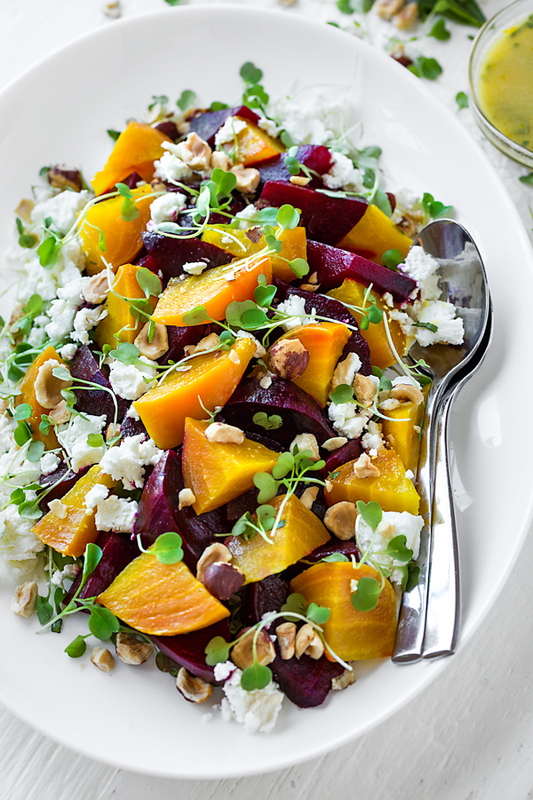 Two colors of beets or one, your choice: I love both the golden and the red beets, so I like to use both in this colorful salad; but feel to use only the red beets or only the golden—whichever you prefer. 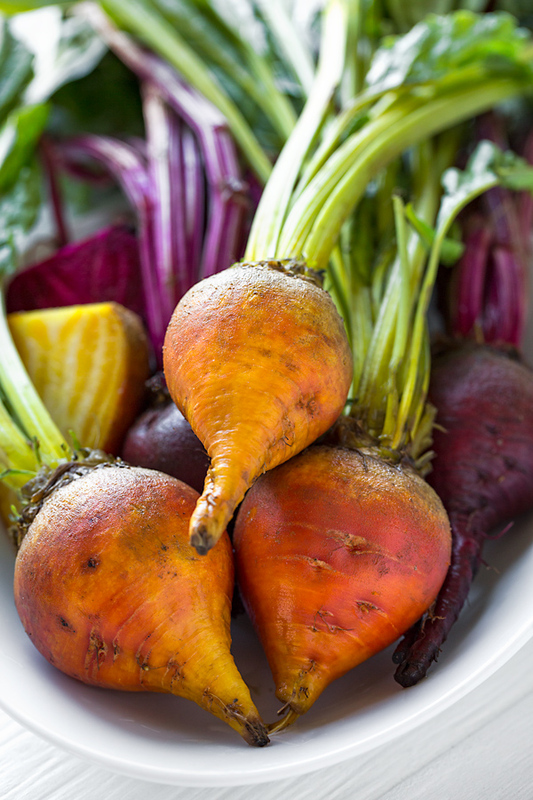 Work with your golden beets first: Whether rubbing the skin off the beets or quartering, begin with the golden beets because they will not color things as the red ones will. If you work with the red ones first, you may color the golden ones with a red hue. Pre-packaged roasted beets in a pinch: Freshly roasted beets are best, but there is a way to cut a lot of the work if you’re looking for a super quick version of this recipe. Purchase already roasted beets in the refrigerated section of your market (near the salad prep items or pre-cut produce). Many have them now, and it’ll save you time and work in a pinch. 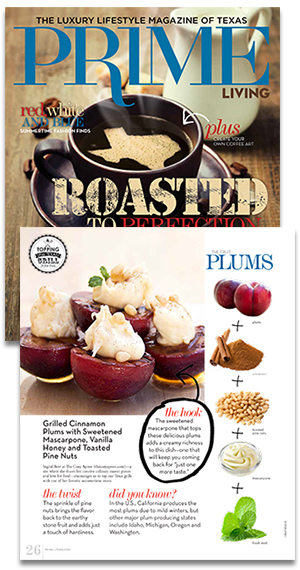 “Warm” roasted beet salad instead of cold: Alternately, you can serve this roasted beet salad “warm”, if you prefer. Simply allow the beets to cool only slightly until you can handle them, then proceed with removing the skin and quartering them, followed by the rest of the recipe. No need to “chill” for this version. Substituting dried tarragon: If you cannot find fresh tarragon leaves, you can substitute dried tarragon, which can be found in the spice/herb section of the market. Just use a little less, about half the amount. Choice of nuts: I adore the toasty flavor of hazelnuts in this recipe, but feel free to use your favorite variety—walnuts, pecans, pistachios or almonds. I might even add in candied walnuts for extra sweetness! 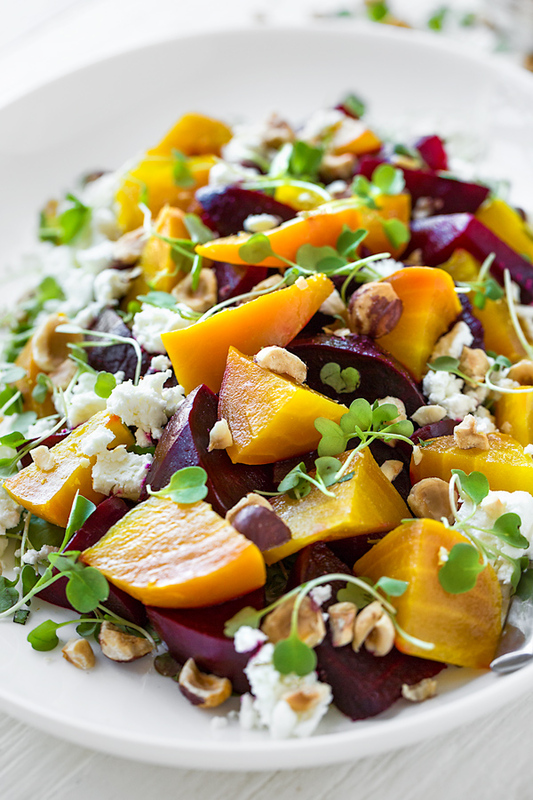 Sweet, cool and colorful, this tangy roasted beet salad has a touch of goat cheese, toasted hazelnuts and a fresh, citrusy dressing! –Preheat your oven to 400°, and line a baking sheet with parchment paper or foil. –Scrub your beets, and trim them of their root-y bottoms and leafy top; rub each with a little olive oil, and wrap each in a piece of foil; place onto the baking sheet to roast for 1 hour, or until you can easily pierce them through the center with a paring knife. 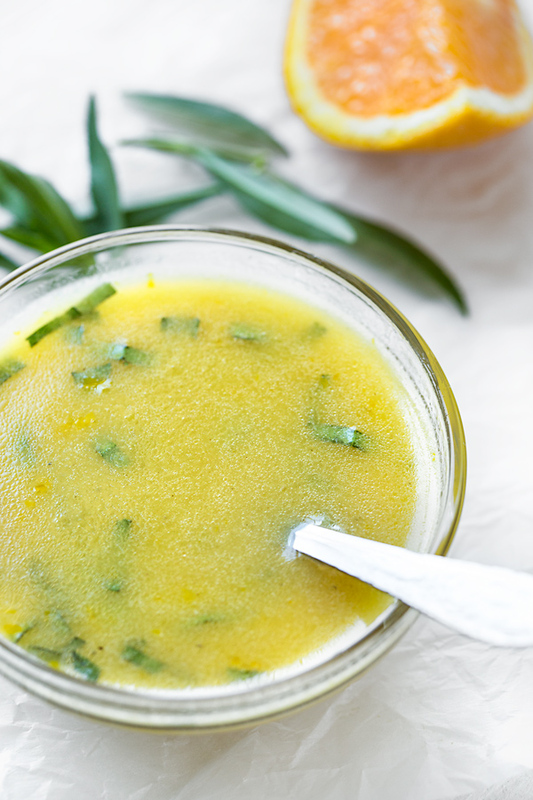 –Meanwhile, prepare you vinaigrette by whisking together all of the vinaigrette ingredients in a small bowl (or you can shake vigorously in a mason jar) until emulsified; set aside. –Once your beets are roasted, remove them from the oven and allow them to cool still wrapped in foil until you can handle them, about 45 minutes; prepare three bowls (one for the skins, one for the peeled red beets and one for the peeled golden beets). –Using a couple pieces of paper towel, rub each of the roasted beets beginning with the golden ones (since they don’t stain like the red ones do) so that the skin comes off, discarding the skin in one bowl, and placing the beets to hold into another bowl; repeat with all beats, keeping the red and golden separate. –To cut them, line your cutting board with parchment, and beginning with the golden beets, cut each in half, then each half into quarters, then those quarters in half, if large; repeat with the red beets. –Place your cut beets into the fridge to chill (alternately, you can even serve this salad as a “warm” salad, in which case you wouldn’t chill). 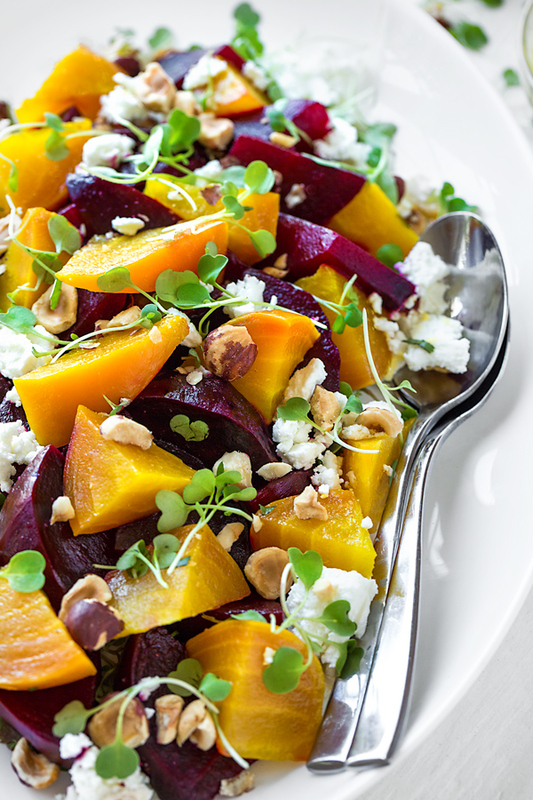 –To assemble, arrange the beets on a serving platter, drizzle generously with the orange-tarragon vinaigrette, crumble the goat cheese over, and give a couple of twists of freshly cracked pepper, if you desire; sprinkle the toasted hazelnuts over, as well as the micro greens, and serve immediately or keep covered and cold in the fridge until ready to serve. Interested in more salad recipes? Check out this Cucumber Salad, this Quinoa Salad, this Warm Roasted Sweet Potato Salad, and this Greek Salad as well! Ingrid, sweetie this looks delicious!! Wow I wish I can have this for lunch now. As always amazing work! WOW!! I’m drooling 🙂 I love beets!!! 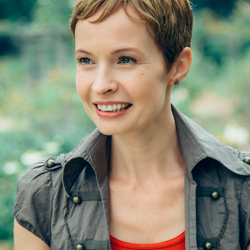 Ingrid, I love that your recipes have high quality nutrition! I enjoy beets (golden beet is my favorite) and am always motivated to cook with them because they’re so great for you! I imagine the vinaigrette recipe you chose is a perfect pair for a warm, sweet, tangy flavor – probably compliments the beets and pistachios perfectly! Thanks for posting such a healthful and elegant recipe! I’ve never cooked with golden beets before but have always wanted to try them! Dear Ingrid ~ J’adore le beets! This is a beauty of a veggie, and as pleasing to look at as it is to eat. I can’t wait to make this. Yum! Sweet friend, I hope you do try it! Michael and I ate this salad for about 3 days after I shot this, and I just said to him yesterday that I honestly could make another batch very soon. We enjoyed it so much with the crunch from the toasted hazelnuts and the goat cheese! I’m so very glad to read that! I cannot tell you how happy it makes me that you prepare my recipes from time to time for your special gatherings/meals with family and friends…it touches me, and fills me with such joy and gratitude to be a little part of them!